Happy Hera-days! Join us at the Hera Collective Holiday Marketplace to shop one-of-a-kind goods made by some of the most talented women in LA. It’s the perfect opportunity to get your hands on some meaningful holiday gifts for friends, fam, and let’s not forget, you. 10% of all ticket sales donated to ProjectQ. All Women. All Local. All Goods. 10% of all ticket sales donated to DIY girls. Spend your evening creating a whimsical & modern wreath with Whit McClure, floral designer behind floral studio Whit Hazen. Whit will gather her favorite branches, dried flowers, berries, cones and fruit she’s been collecting and guide you into creating your own vision of preserving the year’s beauty. Open to all levels! 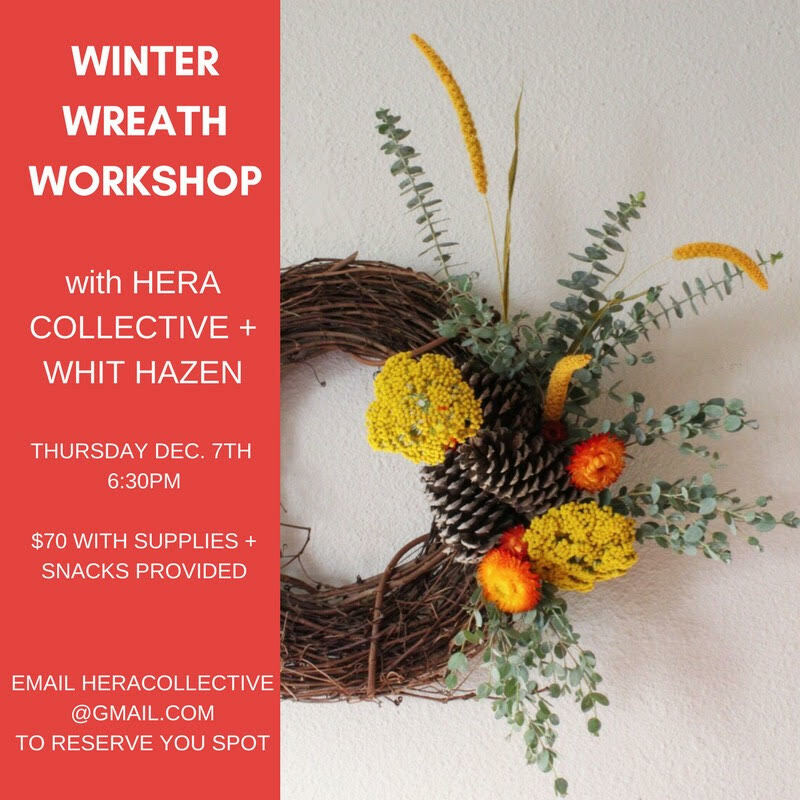 Workshop cost is $70 + includes all materials, snacks, and a wreath of your own to take home! RSVP to HeraCollectiveLA@gmail.com to reserve your spot. Whit Hazen creates bold & whimsical designs with a nod to seasonality for events, businesses & homes with the intention to uplift & share beauty, style, & compassion with others. Whit also enjoys combining her passion for flowers and plants with her passion for social justice, and aims to create more space in the floral design industry for more black, people of color, and lgbtq folks to blossom, share their talents, & thrive. This beginners weaving workshop, taught by Roxy Storm, will teach you the basic stitches and techniques for creating your own woven tapestry. All necessary tools and materials will be provided including a wooden loom handmade in Los Feliz. You’ll also be provided with a goodie bag at the end of the class to continue exploring weaving techniques on your own! RSVP to HeraCollectiveLA@gmail.com to reserve your spot. Roxy Storm is a knit/crochet artist from Los Angeles who received a BA in Art History with a focus on Mexican & Middle Eastern arts. She has been working with fiber arts for 17 years, primarily utilizing vintage yarns and tools from her grandmother's collection. When not working with yarn she's hugging cats and slinging vegan tacos with her boyfriend for their food pop up 100 Tacos. There is something special about wearing your own creation or giving it to a friend to wear. Join Hera Collective artist Jamie Felton in drawing and painting on t-shirts to create a positive female empowerment message on each shirt. In the beginning of the workshop we will be drawing together and collaboratively working to brainstorm images for our shirts. As we draw we will be thinking about signs or symbols of positivity, friendship, favorite body part, favorite plant, favorite color, etc. In the next part of the workshop we will be executing our images onto our t-shirts. We will be using fabric markers, fabric glue, fabric paint and dyes. Jamie Felton (b. 1986) is a painter and educator that lives and works in Los Angeles. Jamie received her BFA from Virginia Commonwealth University and completed her MFA at Tyler School of Art, Temple University, in painting. She participated in Skowhegan School of Painting and Sculpture. Her work has been exhibited at Nudashank Gallery (Baltimore), Interstate Projects, Greenpoint Terminal Gallery, BRIC Rotunda Gallery (Brooklyn NY), Katzen Museum, American University (Washington DC), Vox Populi, Woodmere Museum (Phildelphia), Torrance Art Museum(Torrance CA), Ms. Barbers, BBQLA, Central Park, and As It Stands (Los Angeles). Jamie has attended several residencies including Millay Colony for the Arts and The Lighthouse Works. She has been a finalist for the Dedalus Foundation Grant, awarded the Dean's Grant (Tyler) and was a nominee for the Rema Hort Mann Foundation grant. She has been teaching and working with children K-12 in the Los Angeles area for several years and has experience teaching children at the Delaware Art Museum and the Visual Art Center of Richmond, and worked as a teaching assistant for a variety of undergraduate classes. Hera Collective will be popping up at Oof Books on Saturday, September 23rd from 3pm-7pm. Come eat, drink, shop, and support local women makers! We will have goods from Bani • Böket Skincare • BuckarooCacti • Colabo Collective • Hera Tassels • Just What I Kneaded • Kristina Bing • Ninoshea • Polkadot Peanut Parade • Puppybreath • Reset & Rewind • Sheisme • Stardust Ceramix • and more! Hera Collective will be at Golden Road's Made in LA Music and Arts Festival on Saturday, September 2nd and Sunday, September 3rd. Come shop & support our ladies - 10% of all sales will go to the Light Bringer Project. Böket Skincare • BuckarooCacti • Colabo Collective • Hera Tassels • Kristina Bing • Ninoshea • Polkadot Peanut Parade • Puppybreath • Reset & Rewind • Sheisme • Salamat Ceramics • Stardust Ceramics • and more!